Lady Sclareol Essential Oil - A Perfume with Benefits! Lady Sclareol Essential Oil is a beautiful blend of oils that brings love to the heart. It has a wonderful scent and should definitely be used as an alluring perfume! This romantic blend not only has a seductive scent but the oils contained in it have been used traditionally to support healthy skin. Use it to energize and enhance your evening with your partner or spouse, wear some on your wrists and neck. Or read below for more benefits and uses! This is a fun and easy reference guide for Lady Sclareol Essential Oil Blend. It will tell you how to use your oil blend and what to use it for. It will also provide you with some fun tips and testimonials! 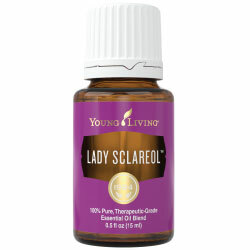 Want to Purchase Therapeutic Lady Sclareol Essential Oil? Go to the Oil Shop! Buy Lady Sclareol Oil Here! What is in Lady Sclareol Essential Oil Blend? Please Note that Lady Sclareol oil was revised in summer of 2012 because of the deforestation and limited availability of Rosewood Essential Oil. See below for revised formula. There are eleven therapuetic grade oils in Lady Sclareol. They are listed below along with a brief description of each oil. Rosewood Essential Oil (Aniba rosaeodora) is supportive to healthy skin; it is emotionally stabilizing and is used for relaxation. Jasmine Absolute (Jasminum officinale)as a wonderful aroma that relieves stress and uplifts the mind and body! It is also beneficial for the skin and supportive of women's challenges*. It has been used throughout history for romance and attraction and for balancing the feminine energy of the body. Clary Sage Essential Oil (Salvia sclarea)has been used for centuries to help support the female body and it's own challenges. It contains sclareol which is very rare when distilling essential oils. Supports normal, healthy attitude during PMS; and menopausal women*. Idaho Tansy Essential Oil (Tanacetum vulgare) has been used traditionally for supporting the digestive system*. Listed in E. Joseph Montagna's The Herbal Desk Reference on herbal formulas, tansy maybe supportive of healthy skin. Sage Lavender or Spanish Sage Essential Oil (Salvia lavandulifolia) is emotionally balancing and is can be used for stress and relaxation. What are the Documented Uses for Lady Sclareol Essential Oil? Emotionally balancing; promotes female sexual arousal; love, romantic intimacy, sexual energy. What is the Spiritual Influence? Lady Sclareol promotes the emotions of love, intimacy and confidence. It helps us release emotional blocks to love, self-love and sharing love. If we are experiencing low sexual urge or frigidity, this oil may help you unblock the emotional issues preventing you from experiencing all of who you are. Can this oil be used for Animals? Yes. Although, I haven’t used it. But if you have, let me know! What are the Safety Precautions? Possible skin sensitivity. Dilute 1:15 to use as a beautiful smelling and romantic massage oil. Or wear on a romantic date as a perfume!